Happy Summer everyone… I can’t tell you how much I’m celebrating the summer right now – no getting up super early to get the kids off to school and no lunch boxes. These two simple things or the lack of means it’s definitely holiday time over here. This celebration cake is good for many occasions – I whipped one up yesterday to take to friends house for Father’s Day. They cooked up a delicious Ottolenghi feast of lamb and fennel salad and I was asked to bring dessert. All the children, Moms and most importantly Dads gathered around the table and sang “Happy Fathers Day to you!” – next year we must stick a candle in the top for all the Dads to blow out or better yet stick sparklers in the top which s what I will be doing for 4th July. It’s easy to make, very light and delicious. The cream, berries and fruit are reminiscent of a trifle. In fact if you use crème patissiere filling for the custard and soak the berries in some booze you are very close indeed. The cake is light and moist and best part it’s gluten free so in many people’s heads guilt free! Makes 2 9″ round cakes. 1. Preheat the over to 350 F. Line the two 9″ cake tins with parchment paper – I like to cut out a circle leaving four tabs to hang over the edge and to ease cake out of tin when cooked. 3. In the bowl of the KitchenAid electric stand mixer with the whisk attachment, whisk the egg whites until you get soft peaks. Add half the sugar (1/2 cup) and beat until you get stiff silky peaks. Set aside. 4. In the bowl of the KitchenAid electric stand mixer beat the egg yolks with remaining half cup of sugar until thick and pale, about 5 minutes. 7. Divide the cake batter between the two parchement paper lined cake pans. Bake in the middle of the oven for 15 – 20 minutes, until the cake has puffed up and the top is dry. 1. Whisk the cream until it holds soft peaks, add the confectioners sugar, vanilla bean paste and cognac (if using alcohol) and whisk until it holds stiff peaks. Be careful not to over whisk – you don’t want the cream to start turning into butter! 2. Place a cake stand over the top of one of the cooled cakes and using the wire rack flip and place cake on platter. Gently peel off the parchment paper. 3. Spread half the whipped cream over the first cake. 4. Sprinkle half the berries out over the cream reserving the prettiest berries for the top and then carefully flip the second cake on top of the first using the wire rack to help. Gently peel off the parchment paper. 5. 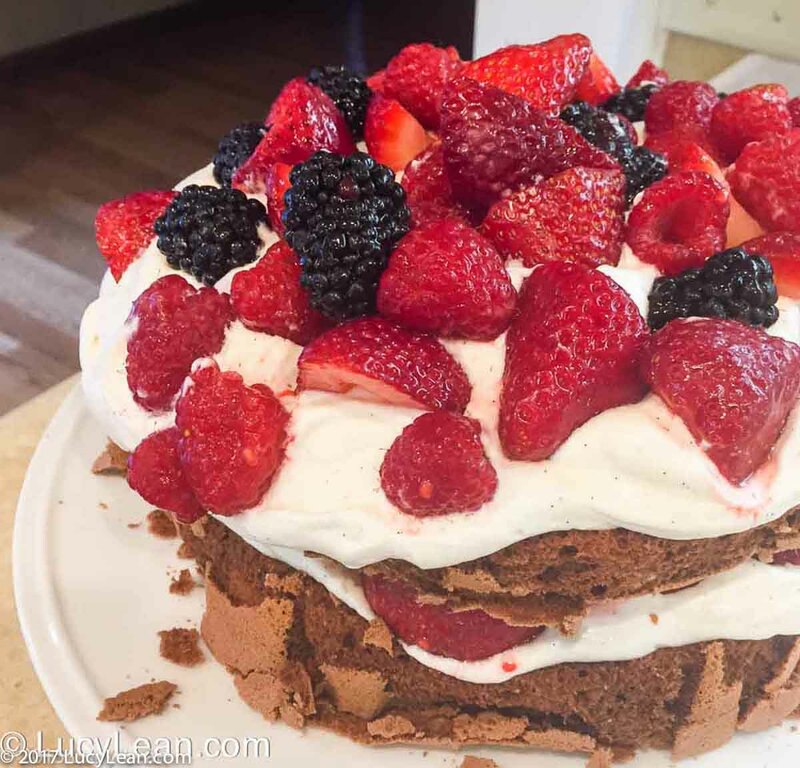 Spread the remaining cream over the top of the cake and decorate with the berries. 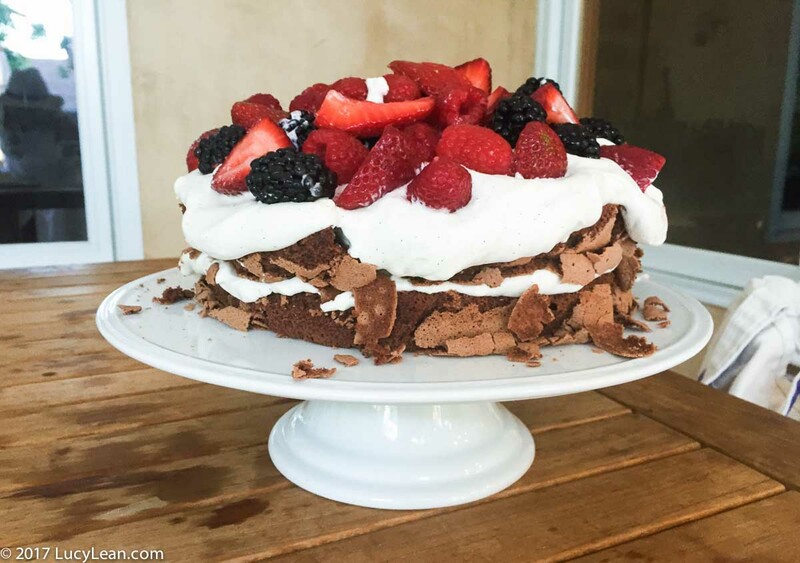 Add edible glitter, a flag, a sparkler or candles – in fact what ever takes your fancy – I will be making this cake for July 4th and arranging the berries in some sort of red white and blue stars and stripes – obviously – and adding sparklers in the top – I will be sure to post on Instagram.